Customer agrees to the Terms of the following provision of the BungoBox SFL Terms and Conditions set forth, and acknowledges that he / she or business entity has care, custody and control of the BungoBox equipment while at the Customer’s location. Customer accepts responsibility for all loss or damage to all BungoBox equipment. If the BungoBox equipment is damaged or lost while in the Customer’s possession, the Customer will be obligated to pay the full retail value listed below plus tax. Customer also agrees to not use any other labels than those supplied by BungoBox SFL. There will be a $5 fee assessed per non BungoBox label. Customer acknowledges that he / she has care, custody and control of the Wardrobe Using tape or any adhesive on the Wardrobes is considered damage and will be included in this obligation. If the Wardrobes are damaged or lost while in the Customer’s possession the customer will be obligated to pay the full retail value of the Wardrobe. Customer acknowledges that he / she has sole responsibility to schedule and be present at appointments for pick-up and delivery of the BungoBox equipment. If the customer does not give 24 hours notice to reschedule appointments, there may be additional delivery or cancellation fees applied in the amount of $75. Customer acknowledges that he / she has sole responsibility to have the BungoBox equipment returned by the agreed upon date. For each additional day the BungoBox equipment is not returned there will be an additional rental charge per piece per day (listed below). If any of the BungoBox equipment is not returned after 30 days and there has been no communication to extend the rental, it is assumed that the customer wishes to purchase the BungoBox equipment; and will be charged the full retail value plus tax (see values listed above). Customer acknowledges that if they sublease or assign any of the above items to a third party that they will be invoiced according to the above terms and conditions and payment will be due according to the terms of their account with BungoBox SFL. Customer acknowledges that their credit card will be kept on file for the duration of the rental agreement. Customer acknowledges and authorizes BungoBox SFL to charge any amount associated with the stated terms and conditions. Liability and Indemnity. The Customer shall be liable for all damage arising from equipment rental use, misuse or negligence of Customer, including any accidents to persons or property arising thereof. Customer covenants and agrees to indemnify and hold harmless BungoBox SFL free from any and all claims, actions, suits, damages and liabilities, including attorney’s fees, arising out of, connected with, or resulting from the rented equipment and / or its complimentary tools or attachments. This includes, without limitations, the manufacture, selection, delivery, possession or use of the rented equipment. Customer agrees to have all boxes and wheels staged in one area for pickup. Customer also agrees to have all Large Boxes stacked 25 high and Large wheels stacked 12 high. Customer also agrees to have all XL Boxes stacked 12 high and XL wheels stacked 8 high. This will reduce the amount of time and disruption at the pickup location. 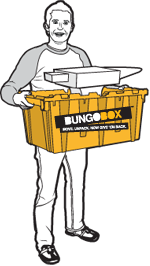 BungoBox SFL employees do not climb stairs to deliver or pickup equipment. If additional time is required for BungoBox SFL staff to prepare this staging process a $50/half-hour fee will be accessed. How to Contact Us. If you have any questions or concerns about these terms and conditions, please contact us at customersupport@BungoBoxSFL.com or call 954.999.2910. Disclosure to Linked Sites. For your convenience this Site may provide links to Web Sites operated by companies affiliated with BungoBox. This Site does not disclose your personal information to affiliated Web Sites.